A bill intended to prevent counterfeit airbags from being installed in vehicles has passed the House of Representatives in the US. The bill (H 1476) - introduced by Pennsylvania Rep Karen Boback - would make it unlawful for an individual to knowingly make, distribute, sell, install or re-install a counterfeit or non-functional airbag. It would also criminalise tampering with readiness indicator lights. "This bill, if passed, would keep Pennsylvanians safer," commented Boback. 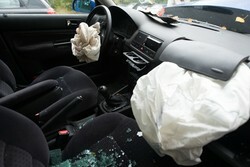 "Airbags are intended to be lifesaving devices and consumers should not have to worry about such devices causing harm." Several other states have passed similar legislation that would protect consumers from the installation of potentially fatal counterfeit airbags. The bill now moves to the Senate for consideration. The bill would introduce fines of $2,500 to $75,000 and up to 20 years in jail for each separate, criminal offence. The Association of Global Automakers - which represents international motor vehicle manufacturers, original equipment suppliers, and other automotive‐related trade associations - has said the issue of counterfeit and non‐functional replacement airbags is a serious safety problem, potentially impacting thousands of US drivers. In 2012, the National Highway Traffic Safety Administration (NHTSA) issued a consumer advisory alerting vehicle owners and repair professionals to the dangers of counterfeit airbags that have been installed in vehicles.